Please note that the application deadline has passed. Applications for 2020 will be available in early 2020, so please check back then. Are you new to the field of fund development? Are you a seasoned fundraising professional with a desire to share your experience? 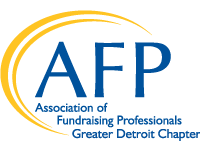 If yes to either, please consider joining the AFP Greater Detroit Chapter's 2019 Mentorship AFP or Marjorie S. Fisher Fellows programs! Mentorship AFP partners new fundraisers with seasoned fundraisers for individualized professional development, guidance, encouragement, and support. Additionally, mentees are invited to participate in six interactive conference calls led by senior level fundraising professionals, and this year's program will include several opportunities for networking with the cohort. "The opportunity to glean tips and tactics from a seasoned fundraiser was priceless." "I was matched extremely well with my mentor and I think this was the most beneficial part of the program." "I want to help make the next generation of fundraisers better." "I am always grateful to be engaged with fundraising professionals at different points in their careers. It energizes me, and helps me to be a better leader and fund raiser." The AFP Mentorship program is offered as a benefit of AFP membership - there is no additional cost to participate. If you have questions about the program please contact Thomas J. Sommer at tjfsommer@gmail.com or 516-592-0237. The application deadline has passed. Applications for 2020 will be available in early 2020, so please check back then.